PRODUCT DESCRIPTION: This unlined adjustable night splint is designed for the treatment of Plantar Fasciitis and Achilles Tendinitis. The economical orthosis features adjustable straps for controlled variable dorsiflexion, limiting nocturnal contractures of the Plantar Fascia and Achilles Tendon. For additional Fascia stretch Metatarsal foam pads are included. For a more custom fit the plastic may be heated with a heat gun and molded into the desired shape. 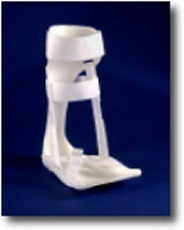 The neutral design fits either foot and is ideal for relieving chronic lower extremity overuse injuries.